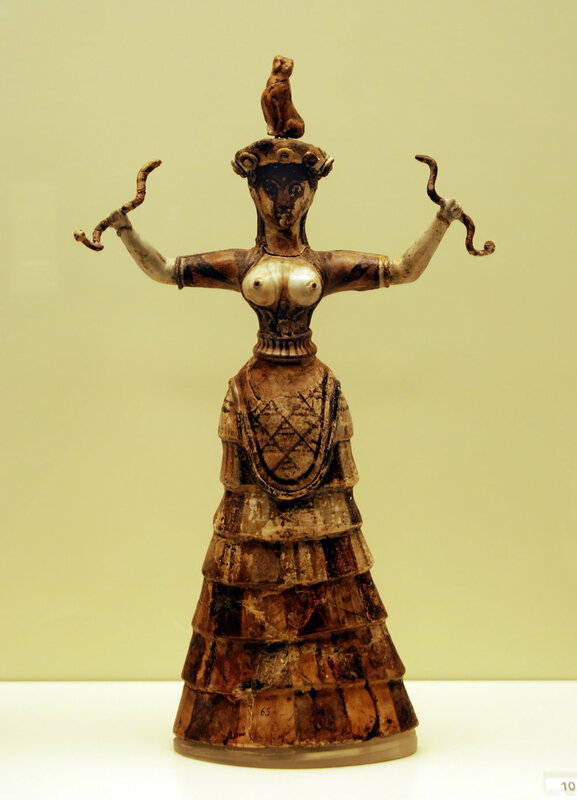 Cretian Snake Goddess. Creative Commons Attribution 2.0 Generic license. There is much speculation about the origins of storytelling. Many books, blogs, articles, research papers and it turns out, videos for the British National Trust, seek to make the case for the centrality and significance of storytelling to human development. No argument from me there. The more we contemplate storytelling and understand its role in the way we think, our perspectives and decision-making, the more we will inevitably seek to create a story for how and why storytelling evolved. A paradox of story perhaps? One day a caveman, possibly two of them, are out hunting and they come across a tiger or a mammoth or a bear, and in the ensuing events the caveman hunter is hurt, but he later realises that if he had done X he would have avoided the disaster. Then after he has recovered enough to sit round the fire in the evening, he gets to talking about what happened and he explains how it happened and what he learned. Sometime later, when other cavemen are out hunting, they remember the story told round the fire, so they avoid doing X and catch the tiger, mammoth or bear. Then they tell the story of how they heard the first story so they knew what to do, and everyone agrees telling stories is life saving and a dam good idea. This caveman/hunter version of life in the good old days is ubiquitous in many fields, and it always drives me nuts, but particularly in storytelling, because the natural place for storytelling to begin had to be with mothers and children. The story surely goes that women, needing to teach their children of the dangers in their environment, either invented or recounted stories designed to scare their children into safe behaviour. Or maybe it was women trying to calm the soothe their children to sleep, or entertain them while they waited for something. It also follows that women as cultural carriers, communication specialists and community creators, shared their knowledge about food, parenting and art amongst each other through stories. The overwhelming evidence of matriarchal and Goddess worshipping cultures pre-patriarchy also points to women as the first storytellers. So one day I hope to see a little video of women as the first storytellers. Any takers?